Background: Due to the increasing number of diabetes cases worldwide, there is an international concern to provide even more effective treatments to control this condition. Methods: This review brings together a selection of studies that helped to broaden the comprehension of various biological targets and associated mechanisms involved in type 2 diabetes mellitus. 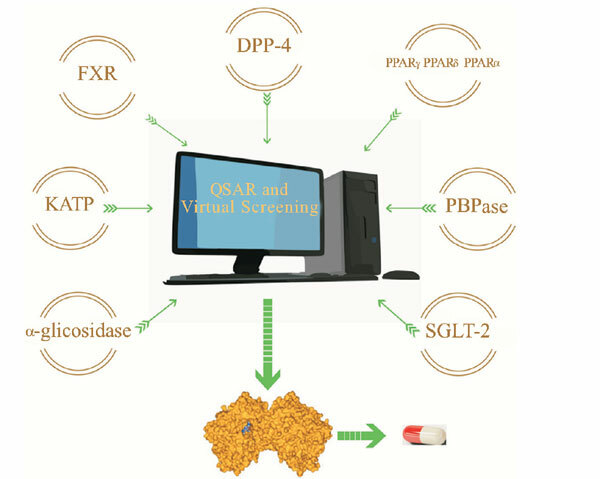 Results: Such studies demonstrated that QSAR techniques and virtual screenings have been successfully employed in drug design projects. Conclusions: Therefore, the main goal of this review is to give the state-of-art for the development of new drugs for the treatment of type 2 diabetes mellitus and to evaluate how computational tools, such as virtual screening and 3D-QSAR, can aid the development of new drugs with reduced adverse side effects. Biological targets, computational chemistry, diabetes, drug design, QSAR, virtual screening.